Our double action stubby candles made with 100% beeswax and all cotton wick. Burn with care candles will drip. The color wax represents what you want to manifest, the black wax represents what you wish to remove or banish. To use these properly you must turn the candle upside down and burn it from the black side first. This is called "butting the candle". To do this you must cut off the tip of the candle and make the top the bottom base. Next carve a new top on the black part of the candle. Light the candle and you are done. 100% beeswax is used for this wonderful green double action stubby taper candle. Approximate size is 4 inches tall. Price is for ONE green double action stubby, other candles and evil eye not included. Color green represents money, wealth, abundance, vitality. 100% beeswax is used for this wonderful red double action stubby taper candle. Approximate size is 4 inches tall. Price is for one red double action candle. Other candles and evil eye pendant are NOT included. The color red is good for removing negativity, or to enhance love/relationships, passion. Made with 100% beeswax. 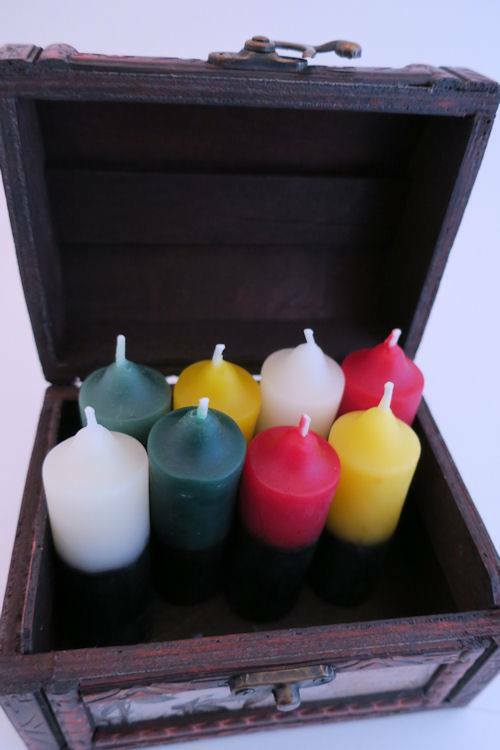 Use our Double Action White candle to return all hexes/evil to sender. 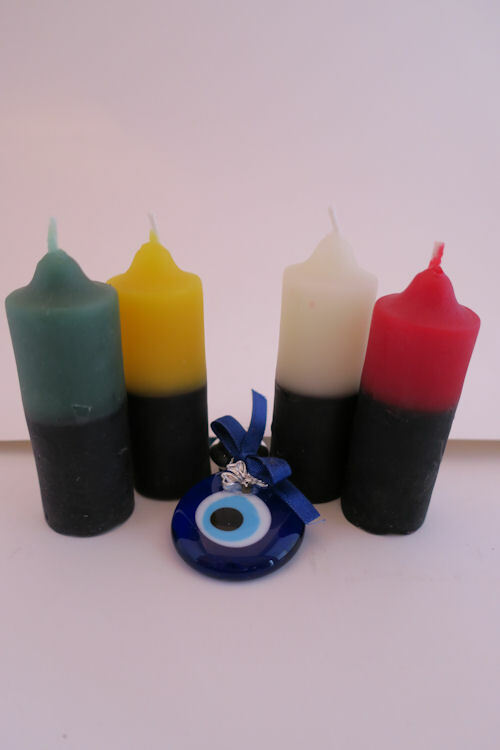 Price is for one white double action candle, other candles and evil eye pendant are NOT included. White is also good for purity, spiritual blessings, healing, and rest. Made with 100% beeswax. Yellow and black, approximate size is 4" tall. Price is for one yellow double action candle. Other candles and evil eye pendant are not included. Yellow is good for devotion, prayer, money, cheer, success, road opening.